Zambia booked their place in the final four for the first time since 1996 with a comfortable win over Sudan. Sudan were one of the surprise packages to make it through to the last 8, finishing above Angola and Burkina Faso. Stoppila Sunzu opened the scoring for the “Chipolopolo” with a fine header. The game turned heavily in Zambia’s favour when Saif Eldin was sent off for a foul on Rainford Kalaba in the box. Star man Chris Katongo slotted in the resulting spot kick to send his team 2-0 up shortly after the hour. James Chamanga later wrapped up the win to send the Southern African side into the semi-finals. The pre-tournament favourites faced the co-hosts in Malabo. 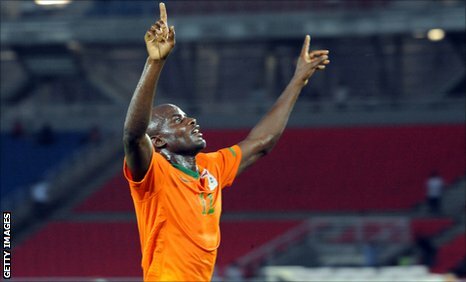 The “Elephants” of the Ivory Coast made light work of the “National Lightning” of Equatorial Guinea with an easy 3-0 win. Chelsea’s Didier Drogba was at the centre of the action throughout, starting off with missing a first half penalty. However, he shortly redeemed himself by opening the scoring with a low strike. Drogba doubled the lead in the second half with a thumping header. Man City’s Yaya Toure wrapped the game up with a stunning free-kick effort. The West African’s are now into the final four, and have been very impressive throughout this competition. As for Equatorial Guinea, despite this defeat, have impressed in what was their first tournament. Mali scraped through to the semi-finals with a penalty shoot-out win over co-hosts Gabon. Gabon lead with Eric Mouloungui’s goal until the 85th minute before Tidiane Diabate equalised. They were later made to rue a host of squandered chances, including twice hitting the woodwork through former Rangers and Hull striker Daniel Cousin and star man Pierre-Emerick Aubameyang. Neither side could break the deadlock in extra time. 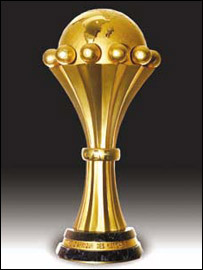 Mali won when Aubameyang missed a crucial spot kick. Mali and Barcelona midfielder Seydou Keita admitted his side’s victory was not attractive, but that his team had done well to overcome the determined co-hosts. Ghana edged past Tunisia with an extra time Andre Ayew goal. The “Black Stars” have not won the African Cup of Nations in 30 years and many feel like this could finally be their year. Captain John Mensah out them ahead after 9 minutes before Sabeur Khalifa equalised for Tunisia just before half-time. They were gifted their win when Tunisia keeper goalkeeper Aymen Mahtlouthi spilled a cross for Andre ‘Dede’ Ayew to tap home. The Semi-Finals take place on Wednesday, with Zambia facing Ghana in Bata and Mali taking on Ivory Coast in Libreville. 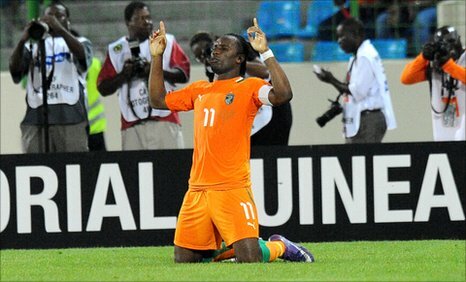 My prediction is that it’s hard to see past a Ghana-Ivory Coast, with the Ivorians winning….Zambia for 3rd place.